4th May 2012. District Council Elections and Mayoral Referendum vote counting at Thornes Park Athletics Stadium, Wakefield. Chief returning officer Joanne Roney reads out the decision that voters had voted to keep a concil leader and not a mayor. The candidates standing for this year’s Wakefield Council elections have been announced. 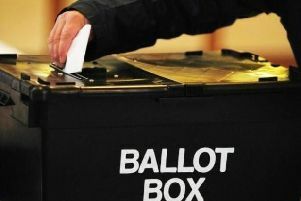 Eighty candidates will stand for 21 seats in the district council elections. One seat will be contested in each of the district’s wards. The council is currently in Labour control - Labour councillors hold 53 seats, Conservative councillors hold six seats and UKIP and Independent councillors hold two apiece. Counting of Ballot forms by Wakefield Election staff in vote to name new Castleford Museum / Library.